I'm ok with admitting this: I miss the days when the label size actually meant something. Enough with the vanity sizing! I'm aware I'm not a waif of a woman, so J. Crew, as much as I love you, stop lying to me. I have no business fitting into 4s and 6s and smalls! I'm 5'9! This skirt however is back from when the vanity sizing wasn't as ridiculous and fits the way it should. 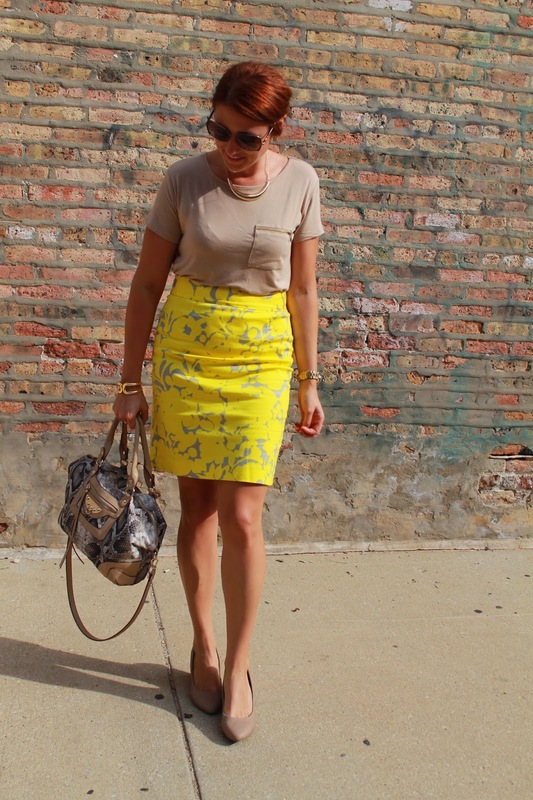 And you know I'm always down with a great yellow skirt! Here is one that you can still get your hands on! I looooove this color combo!! And you are working it, hot mama!! Love this skirt and how you paired it with a neutral top! I hear ya, I wish sizes would actually fit like the size they say they are...would make shopping online a whole lot easier too not having to buy multiple sizes of everything!